Picosso first visited Paris in 1900 and set up a studio in Montmartre. By this time Montmartre had developed a reputation as the bohemian centre of the city and was a mecca for artists. Situated on the hills to the north of the city Montmartre's rural past could still be detected by the presence of its most famous windmill, the Moulin de la Galetl By the time Picasso first visited it, however, the Moulin de la Galette had long since ceased to function as a workii windmill, having been transformed into a tavern and dance hall that had become a centre of Parisian nightlife. 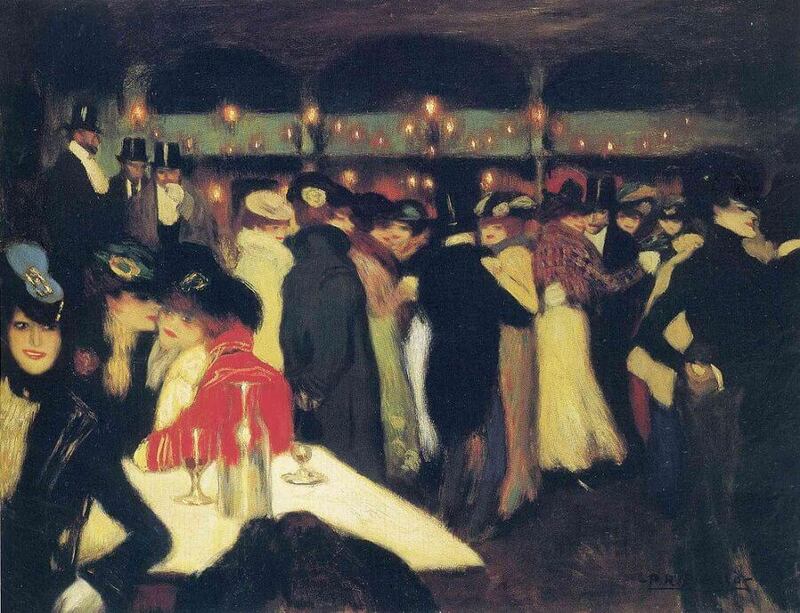 Picosso was not the first artist to paint the Moulin de la Galette - both Pierre-Auguste Renoir and Cezanne had previously depicted this famous site, Indeed, Picasso was heavily influenced by Toulouse-Lautrec at this stage of his career, This work shows a busy night scene crowded with well-dressed men and women. The bright, lurid colours and garish lighting aptly highlight the gaiety and splendour of turn-of-the-century Paris, widely regarded as the playground of Europe.